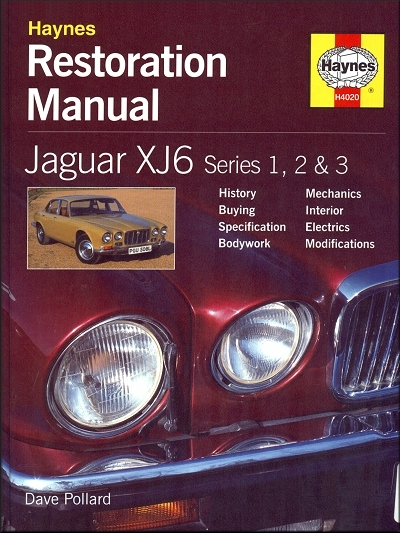 This Haynes restoration manual, covers all Jaguar XJ6 Series 1, 2, and 3 models. How to Strip Down and Rebuild an XK Engine, with Tuning Hints and Tips. How to Renovate Bodywork, Including the Renewal of Major Panels and Repainting. How to Renovate Interiors, Including Seat Repairs. What to Look for When Buying a Project Vehicle and the Pitfalls to Avoid. How to Give New Life to Mechanical and Electrical Components, Including Automatic Tranmsission Overhaul. How to Plan and Carry Out DIY Modifications. Though XJ16 front wings rust away with alarming rapidity, there are bolts-on units and relatively off-the-shelf from companies such as SNG Barratt, and they are relatively easy to swap. Spray the fasteners with plenty of WD-40 or equivalent, ideally the day before removal starts. Be prepared for at least one fastener to seize or snap. This may mean drilling out a seized bolt or even doing a spot of re-tapping, so allow some "emergency" time. Before starting work, Phil unplugged the wiring to the headlamp, side lamp and indicator. Don?t forget that on Series 3 cars, there?s a wing-mounted side repeater lamp to remove also. Two screws hold the lens cover in place, and when removed the two screws holding the base to the wing can be accessed. They are quite small and easy to snap if they?re even slightly rusted. Phil treated all the fasteners to a healthy dose of WD-40, letting it soak in as long as possible and reapplying through-out the procedure. This is the rear stone protector panel which is secured by bolts around its perimeter. It?s almost certain that at least one of them will seize and snap, so be prepared. Having removed all the bolts, you can see that rot has started to attack the edges of the panel. It would be possible to weld patches around the affected areas, though a new panel would be a simpler option. Phil removed the two rear wing mounting lower bolts and the two accessed from the A-pillar (the top one is shown here with the spanner on). He moved to the front of the wing and removed the remaining five bolts and the self-tapping screws securing it to the top stone panel. Then, it was outside the car to remove the series of bolts which run along the top of the wing, which meant that the wing could be lifted away. Even if your wings don?t need replacing, there?s no doubt that it makes working at the front of the car much, much easier. Access the brakes, suspension and steering components is much improved, not to mention de-rusting and applying underseal. Barrats supplied the new wing (at right!) to replace that rusty specimen Phil had just removed. Fitting the new wing is a reversal of removal process. Phil used new nuts and bolts where appropriate, cleaning-up and applying copper grease elsewhere. The inner bore of the clutch drum runs on two Teflon sealing rings and needs to be checked for wear-if not perfect. It must be replaced. The inner part of the piston, which runs on a large rubber inner seal, needs to be checked for scoring, and the relief valve must be working. Graham replaces the clutch pack if it has scored the pressure plate where the friction plate runs against it. He also always changes the diaphragm spring, as they invariably crack in use, for a stronger aftermarket spring. Check that the splines are not worn or damaged on the input shaft, that the bush at the back of the shaft isn?t worn and that the surface where the last clutch friction runs on it is in good order. The sealing ring grooves on the shaft were filled with Vaseline ready for the split Teflon sealing rings. Graham applied lots of Vaseline to the shaft and lower part of the inner drum. The piston seal goes on first, followed by six Belville washers. These are dished and have to go in alternately face-down then face-up. At the top is a steel wear ring so that the diaphragm spring presses on that rather than soft aluminum. There is a square section O-ring which fits on the outside of the piston. Graham put plenty of Vaseline in the pump itself. A special tool is slotted temporarily into the housing to ensure that the piston fits squarely in the bore and that the O-ring isn?t damaged in the process. This is tapped lightly with a plastic mallet until the piston is fully home. TABLE of CONTENTS: Acknowledgements | Introduction. 1. HERITAGE: Jaguar XK Saloons up to Mk X and S-Type | Jaguar XJ6 History: Series 1, Series 2, Series 3 | A Classic Coupe | Jaguar XK Saloon Production Details | XJ6 Technical Specifications | Identify Your XJ6. 2. PREPARATION: Dismantling and Space | Workshop Procedures and Safety First | Raising Your Jaguar Safely | The NBN Chassis Tilter | Tools and Equipment | Buying Spares. 3. BUYING AN XJ6: Buyer Beware! | Where to Start | Which Model? | Bodywork, Electrics and Interior | Engine, Exhaust, Emissions, Air-Conditioning and Transmission | Brakes, Steering, Suspension, Wheels and Tires | Accessories, Modifications and Insurance | Road Testing | Doing the Deal. 4. BODYWORK: Hints and Tips | Bodywork Basics | Welding | Removing and Replacing a Rotten Sill and Rear Wheel Arch | Replacing/Repairing a Front Crossmember | Removing the Bonnet and Grille | Headlamps, Side Lamps and Indicators | Removing Front and Rear Doors | Removing the Front Wing | Fuel Tank Removal | Windscreen Removal, Wipers, Wiper Motor and Washer Motor | Dealing with Rust. 5. PAINTING AND FILLING: Abrasives Guide | Aerosol Paint Spraying | Putting on Paint | Using Filler. 6. UNDER THE BONNET: Removing the Engine and Gearbox | Engine Stripdown and Rebuild | Fuel?Carburation and Fuel Injection | The Cooling System | The Exhaust System. 7. TRANSMISSION: Automatic Transmission Specifications | Stripdown and Rebuild of Automatic Gearbox and Torque Converter | Rear Clutch Drum | Front Clutch Rebuild | Manual Transmission and Clutch | Propeller Shaft and Universal Joint | Rear Hubs. 8. BRAKES, SUSPENSION AND STEERING: Brake Discs, Calipers, Pads and Pistons | Front Wheel Bearings | Removing and Replacing Flexible Hoses | Rigid Brake Lines | Master Cylinder | Brake Servo Unit | Rear Discs, Pads and Calipers, and Handbrake | Bleeding the Brakes | Front Suspension | Rear Suspension | Steering. 9. WHEELS AND TIRES: Buying Wheels | Refurbishing Alloy Wheels | Original Tire Specifications. 10. THE INTERIOR: Door Trim Panels | Carpets | Seats | Cleaning and Treating Leather Trim | Seat Diaphragm | Wooden Trim | Stain Removal Guide | Seat Belts. 11. SECURITY: Thatcham | Sold Secure | Getting Physical | Electronics | Wheels and Tires. Ask a question about Jaguar XJ6 Series 1, 2, 3 Restoration Manual. Prompt service with reliable tracking information. Restoration manual provides invaluable information.